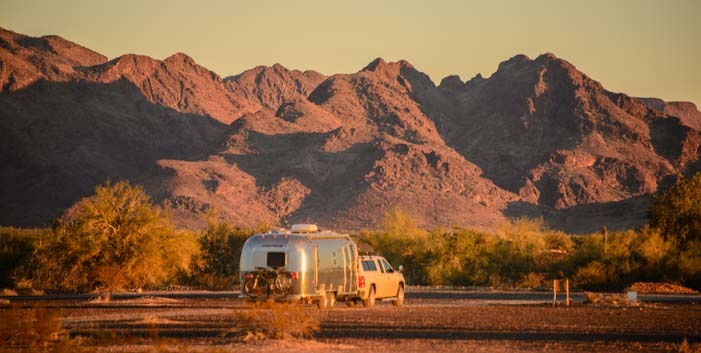 Quartzsite Arizona - RV Madness in the Desert! Quartzsite Arizona – RV Madness in the Desert! January, 2015 – For the past few days, we’ve been boondocking in the heart of snowbird RV madness in Quartzsite, Arizona, alongside tens of thousands of other RVs. This is a wild and crazy place full of wacky seniors soaking up the warm sun and living it up in the desert. Quartzsite is such a small blip on the map on I-10, between Phoenix and LA, that few motorists on the interstate give it the time of day, unless they need gas. However, flocks of RVs descend on it every winter, because of the massive tracts of BLM land (and free camping) that surround the town. Stretching in a ten mile radius from the I-10 exit, the land is open, vast, and empty. It is also naturally hard packed gravel, which makes a perfect surface for driving and parking. 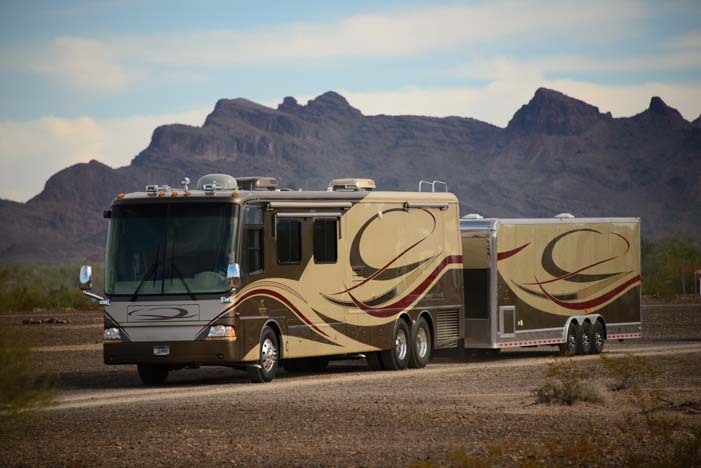 RVers set up camp in the desert anywhere they wish. 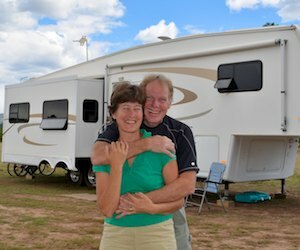 When the annual week-long Quartzsite RV show starts in January, RVing groups of all kinds stake out sections of the desert as their own. The desert becomes littered with signs pointing to the various gatherings. We drove 13 miles to the northeast of town, to a far corner of BLM land on Plomosa Road. We passed thousands of RVs randomly parked all over the place before we finally turned off the paved road and drove out into the desert ourselves. Was this remote spot quiet? Heck no! We could see RVs parked as far as a half a mile or more from the road — on both sides! We rode our bikes around to check out the neighbors and discovered we had parked just a few yards from the Alpine Coach Association rally. Ninety Alpine motorhomes were lined up in a huge U-shape around a big tent (where breakfast, dinner and cocktail parties were held), and lots of members who couldn’t squeeze into the U were camped on the outskirts. The Montana fifth wheel circle was close to us too. Just past the Alpine motorhomes, a Montana fifth wheel rally had formed an enormous circle of the wagons. Each Montana fifth wheel had parked facing outwards, and a huge collection of camping chairs surrounded an enormous campfire in the middle. We were told 70 Montanas had come to the rally, and dozens of trailers that didn’t fit into the circle were camped all around the outside. The heart of every gathering is the campfire — and you just can’t have enough wood! Tiffin Motorhomes, Safari Motorhomes, Pacer Motorhomes and even a tiny Hitchhiker fifth wheel group had staked out places in the desert. But it isn’t just RV brands that bring people together for cocktails by a campfire here. The Roving Rods, several Escapees chapters, and other groups had gathered in various spots too. One had built a huge woodpile that would be burned each night throughout the week. Groups posts signs so they can find each other. We seemed to be in the midst of several enormous singles groups too. The Escapees Solos, the WINS (Wandering Individuals Network) and the LOWS (Loners on Wheels) were all camped near us. 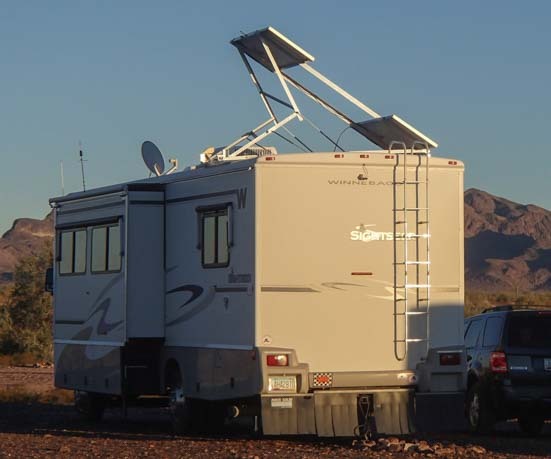 Boondocking in Quartzsite is an art form unto itself, and we saw rigs of all kinds. Everyone is living on solar power or generator power, and some of the solar power getups we saw were fantastic. 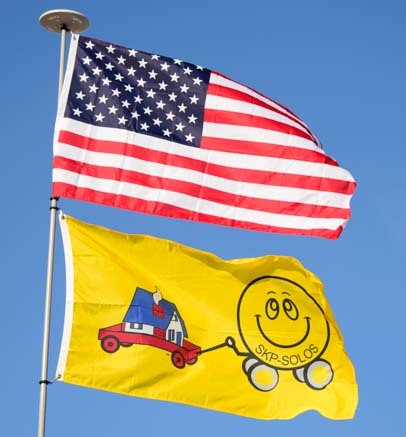 Because solar panels produce a lot more power in the wintertime if they are tilted to the south, RVers get very inventive with ways to get as much solar power as possible. Everyone is towing something, and sometimes they even match! 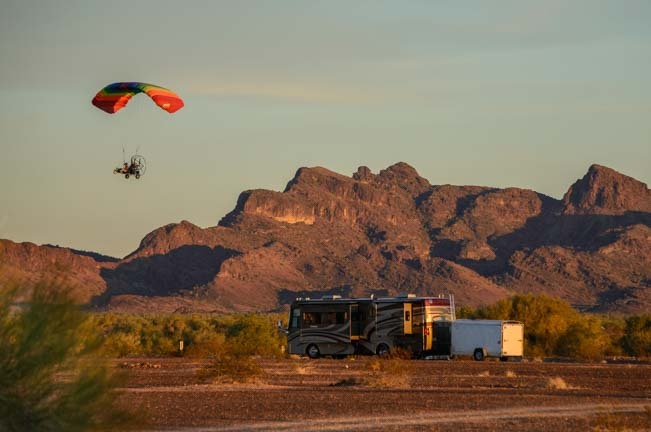 Quartzsite attracts a wild mix of people and rigs. You never know what you’ll see. One minute we saw a motorhome towing a trailer that had an elaborate matching paint scheme. When one motorhome isn’t enough! The next minute we saw a Class A motorhome towing a Class C motorhome beind. A mother-in-law suite! What next?! Some folks put art on their rolling homes. There are homemade rigs, bus conversions of every vintage, and some really amazing paint jobs to boot. The mobile RV mechanics have steady work during the winter months in Quartzsite, and we saw quite a few at the different rallies. Your awning all hosed up? This guy will come to you! Need that huge motorhome windshield replaced? No Problem! 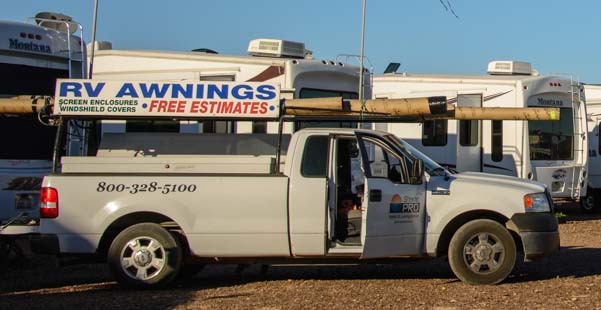 Awning specialists, RV glass replacement specialists and general mobile RV mechanics were on the loose out in the desert, and they were finding plenty of work, I’m sure! 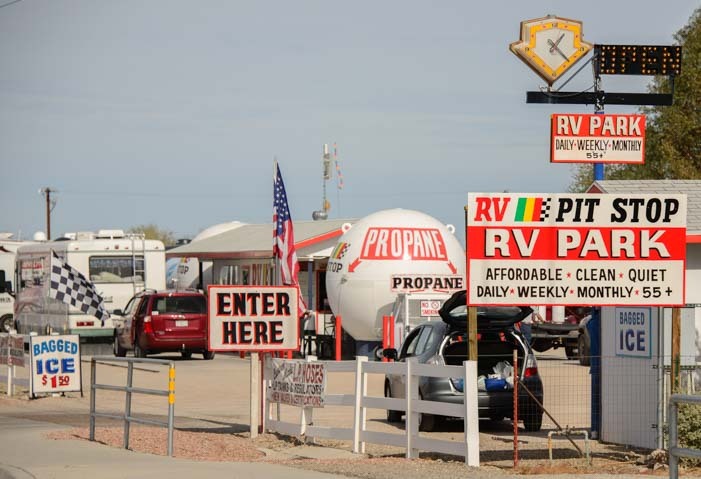 RV Pit Stop — A drive through for dumping the waste tanks and getting fresh water and propane. Near town there is a wonderful service station that we’ve never seen in any other part of the country: the RV Pit Stop. It offers all the basic RV services in a drive-through. You can dump your holding tanks, fill up on fresh water and get propane all at once. And propane at $2.30 a gallon is a sweet deal too! In Quartzsite, always expect the unexpected! Quartzsite in January is a place like no other. Part Burning Man/Woodstock, part flea market, part trade show and part AARP convention, it has to be seen to be believed! If you’re looking for serenity in the desert, you won’t find it here. On the other hand, you might look up and see an ultra-light flying over your rig at dusk, and there’s something very fun and funky about that. And that’s the essence of Quartzsite! Had to laugh; how true! Hope you made it to the “famous” bookstore!